March Madness is back. It’s a great time of year – the games are usually excellent, the stories are endless, and it means baseball is right around the corner. Most people fill out a bracket with friends or in office pools for a little money, though Warren Buffett has offered $1 billion to anyone that makes a perfect bracket. Well, of course we all try for a perfect bracket, but I think it’s safe to say that Buffett won’t have to make the payout. Because while there is endless discussion on upsets and sleepers and cinderellas, there is one thing Buffett has on his side. Math. In the tournament, 64 teams play a total of 63 games (if you exclude those four play-in games, which I do). Therefore, there are 2^63 possible outcomes, and the odds of picking a perfect bracket are 1 in 2^63, or approximately 1 in 9,223,372,036,854,775,808. Approximately. If everyone in the US (~315 million) fills out a bracket this year, and for the next 100 years, the odds of a perfect bracket are 0.00000034152368%. If everyone on earth (~7 billion people) filled out a bracket every minute for the next 100 years, there is about a 4% chance of a perfect bracket. If everyone who has ever lived (~100 billion people) filled out a bracket every minute for 100 years, then, well, yes, odds are that someone would fill out a perfect bracket. But that’s a lot of people. And a lot of time. These odds don’t take into account that not all games are equally weighted – a 16 seed doesn’t have a 50% chance of beating a 1 seed. But the point stands – it is incredibly difficult, nearly impossible, for a human to choose a perfect bracket. No one has ever done it. 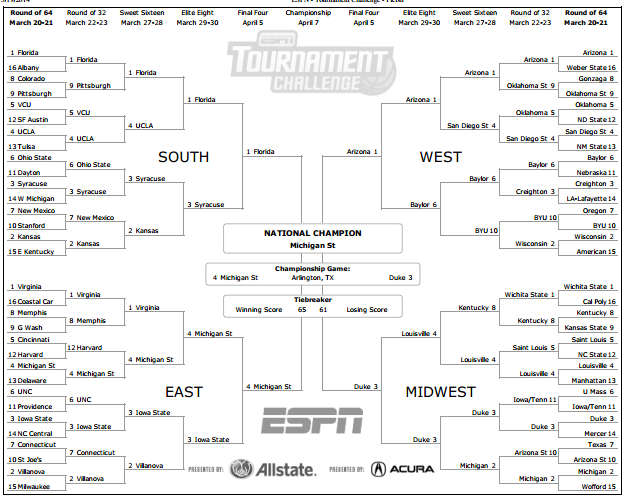 NONETHELESS, I am confident that my bracket this year is perfect, though if you want any analysis you’ve come to the wrong place.